The forces of nature and Gaia's blessings are not enough to stop the curse from spreading throughout the Valley of Life. The druidic clans are now harnessing the power of arcane magic to repel the blight and heal the land. While arcane magic offers tremendous power, is can quickly overwhelm those who are unable to control it. 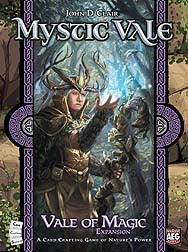 The Vale of Magic Expansion adds new advancement and vale cards to the base Mystic Vale game, giving players more card crafting options and exciting new possibilities for powerful combos.